New Delhi: The All India Institute of Medical Sciences, Patna (AIIMS Patna) released 10 job vacancies for Junior Resident (Non-Academic) post in the Department of Anaesthesia on Adhoc Basis. The selection will be done on the basis of Walk-in-interview. AIIMS Patna invites applications for appointment of the posts of Junior Residents on Adhoc basis for 89 days. Last Date to apply: 30-03-2019. Note: Vacancies may increase or decrease at the time of selection. The number of vacancies indicated above is provisional and subject to change without any notice. Qualification: A Graduate degree (MBBS) from a recognized University/Institute. 1.UPPER AGE LIMIT (as on date of interview) will be 33 years. 2. (i) Relax able for SC/ST candidates up to a maximum period of five years and in the case of OBC candidates up to a maximum period of three years. (ii) In the case of Orthopedic/Physical Handicapped (OPH) candidates up to a maximum period of 5 years for UR, 8 Years for OBC and 10 years for SC/ST category candidates. Pay Scale: As per under Govt.rules. b. No fees required for SC/ST/PWD/Women candidates. c. The fee shall be received in the form of Demand Draft drawn in favour of “AIIMS Patna” payable at Patna. (The Demand Draft will be received on the day of interview). No other mode of payment i.e. Cash/Cheque/Postal order will be entertained. Canvassing in any form will disqualify candidate. Crucial date for determination of eligibility with regard to age, educational qualification and experience etc. will be the date, the candidates appear in the interview. Person with disability are required to produce the physically handicapped certificate (with degree of disability) in original issued by the competent authority (i.e. Medical Board duly constituted by the central Govt. or State Govt.) at the time of interview. Subject to availability, Residents Doctors will be provided accommodation in the resident Hostel. Selected candidates will be paid consolidated salary as per GOI. (ii) Certificate of Date of Birth. (iii) Certificate of SC/ST/OBC (Non-Creamy Layer) certificate from the competent authority if applicable. (Candidate must submit the latest OBC certificate issued on or after 01-04-2016 by the competent authority of Govt. of India in Format given by DOPT/Govt. of India or for the appointment to the Central Government job.). (vii) MBBS Internship Completion Certificate. (viii) Medical Registration Certificate from MCI/State Medical Council. (ix) NOC from the present employer (if employed). (x) MS/MD/DNB passed certificate (for senior resident post). (xi) MS/MD/DNB Mark sheets (if applicable). 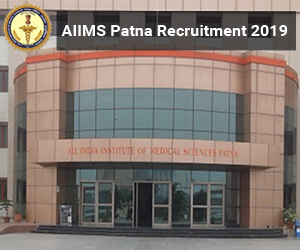 AIIMS Patna reserves the right to make amendments to the number of posts advertised based on the functional requirements to the institute and to fill or not fill up the posts partially or completely without assigning any reason.